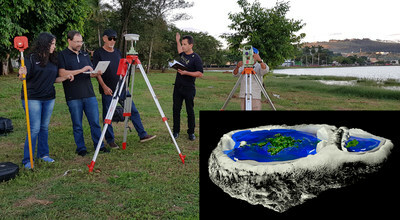 SAO PAULO, March 29, 2018 /PRNewswire/ — After seven years of research on the shape of the Earth, scientific experiments conducted by Brazilian researchers at Dakila Pesquisas, in partnership with professional scientists from different parts of Brazil and other countries, such as the United States, Russia, Chile, Holland, Spain, have demonstrated that the Earth is not spherical. The evidence was presented in the feature-length Convex Earth: The Documentary, made available today (March 29) at the website convexearth.org in Portuguese, English and Spanish. Seven scientific experiments were conducted, among them, a geodesic experiment, which consisted of measuring the distances between the base and the tops of two buildings, one in Torres (Rio Grande do Sul) and the other in Natal (Rio Grande do Norte), with a distance of 3,050 km between them, using sea-level as a reference. “The measurements were equal. If the Earth were round, the measurement of the distance between the bases of the buildings should be smaller that the measurement between the tops, because they would be in keeping with the curvature of the Earth,” explains Urandir de Oliveira, founder of Dakila Pesquisas. Engineers from the National Institute of Settlement and Agrarian Reform (INCRA – Instituto Nacional de Colonização e Reforma Agrária) took part in the action. A long-range laser was used to measure the flatness and levelness of the waters at the Três Marias Dam in Minas Gerais; the Lagoa dos Patos, in Rio Grande do Sul; Lake Titicaca in Peru; on the seas around the island of Ilhabela in the state of São Paulo, and at the Straits of Gibraltar. The tests conducted for up to 35 km did not identify any curve. Experiments conducted with refracting and reflecting telescopes proved that ships do not vanish at the horizon line, but rather that we lose the ability to observe them, due to an optical phenomenon. This phenomenon was studied by the researchers, who formulated a new theory, which explains physically and mathematically how this works. Meanwhile, experiments conducted with a plumb line (for verticalization) and a level (for horizontalization) proved that gravity does not exist, since the physical behavior of water is to seek its own level, that is, towards flatness. According to Urandir, what keeps us firmly on the ground is MDPL (magnetism, density, pressure and light). Through images obtained by various atmospheric probes launched by researchers, as well as expeditions that have taken place, even in Antarctica, with the collaboration of soldiers in the Armed Forces of Brazil, as well as other analyses of materials found in glaciers in Siberia and on the fringes of the Arctic Ocean, such as pollen, dust and leaf fragments, a new continent has been discovered, called “Greater North” (“Norte Maior)” separated by a great mass of ice. The path of the heavenly bodies, including the sun and the moon, as detected by equipment does not agree with what science tells us. This new information has made it possible to determine the correct position of the continents, and this will soon be disclosed.